Facebook is officially changing the game (AGAIN) for businesses. By this point, Facebook’s business-user segment has gotten used to the constant changes from the platform. Long gone are the Wild-Wild-West days of old where merely building a large following meant free advertising. Nowadays you practically have to hack your way to views, logarithm-tweak posts to earn strong results and flat out pay more to get more back. Get ready to re-learn that system. Announced this month, Facebook will begin prioritizing posts to users that friends have interacted with over publishers and brands. Meaning the 349 photos your sister-in-law uploads of her cat each week will start taking priority over ads featuring Oreo’s newest flavors; Pina Colada, Kettle Corn and Cherry Cola (yes, those are all very real and hopefully for all of us, they will be short-lived). Or will we still see those ads? Some think this will prove inconsequential for big brands with unlimited funds, leaving the small fish without a pond to swim in. Only time will tell. The use of Micro-Influencers in social media marketing will grow. 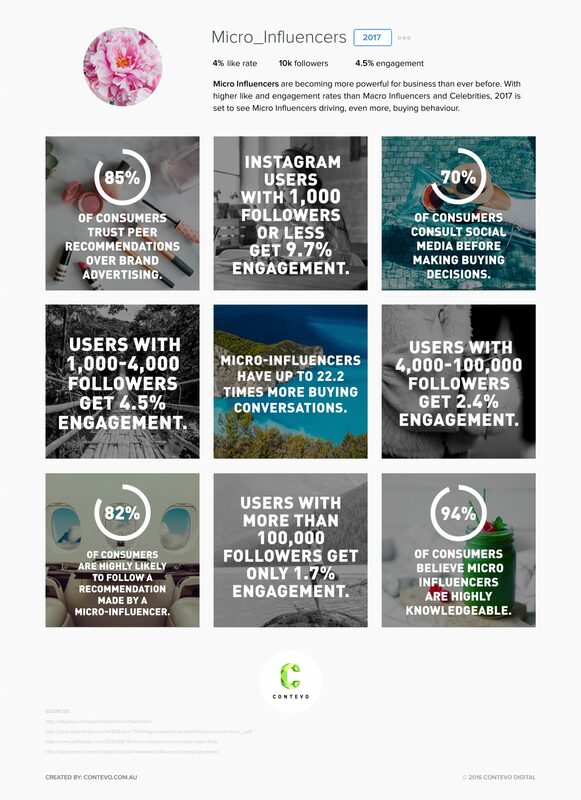 According to this infographic posted on Contevo.com, 85% of consumers trust peer recommendations over brand advertising and 82% of consumers are likely to follow a recommendation made by a micro-influencer. The definition of ‘micro-influencer’ is debated on in terms of the number of follows one must have to truly be micro but it is widely argued that this falls somewhere between 1,000 – 100,000 followers. Micro-influencers typically work in one niche, such as photography, beauty products, parenting, travel, fashion or music. And their follower-base is engaged in a way that can’t be found in celebrities or other users who have follower numbers in the millions. Using the same infographic mentioned above, we can see that Instagram users with 1,000 followers or less maintain around 9.7% engagement rates, while users with over 100,000 followers typically get only 1.7% engagement. Furthermore, 94% of consumers believe that micro-influencers are highly knowledgeable. Businesses seek out micro-influencers because of their excellent engagement rates with their followers but also because of the low-cost involved in utilizing them. Many micro-influencers charge low rates or even accept items in exchange for running promotions on their page. 3. Interactive Advertising is on the rise. As businesses continue to fight to get attention in increasingly-congested networks — targeting users with micro attention spans, standing out means more than just having a great slogan or visually engaging campaign; it means finding new ways to interact with consumers to creatively create attention for a brand. Last May, M&M launched a new flavor through an immersive experience in Times Square that utilized augmented reality, transforming a dozen billboards into an “AR arcade” that allowed users to interact with the brand through use of an app on their cellphones. The effort resulted in 147 million earned media impressions. More recently, Ikea launched an ad campaign that leveraged pregnancy-testing capabilities to offer users discounted pricing on cribs with a positive test result. Although asking consumers to pee on an ad might be pushing the threshold of interactivity, it illustrates the power that comes from offering an ad experience that is much more than just static photography and copy on a page. According to an article on Inc.com, video will account for nearly 80% of all internet traffic by 2019. The same article suggests that including video in an email can lead to a 200-300% increase in click-through rate. The best stat though, and the one most important to marketers – 90% of users say that seeing a video about a product is helpful in the decision-making process. The reason? Even though we may have abandoned malls and big-box stores in favor of online shopping, for the most part, we’re still wired to want to know as much as we can about a product before we purchase it. The same goes for a brand. We want to know as much as possible before deciding, and video offers the ability to pack a wealth of information and character into a short clip. Video is also great for content marketing. And guess what? Content marketing isn’t going anywhere either. As more and more consumers continue to fall into the “not interested in traditional marketing” camp, more and more businesses are shifting their ad dollars away from the old methods of advertising and focusing more on content marketing. The problem? Most consumers, especially younger consumers, can sniff out the fake messages. So, you MUST be authentic! Patagonia continues to offer great examples of content marketing done right. The 45-year-old outdoor apparel retailer ran its first television ad last fall, which featured the company’s founder, Yvon Chouinard, speaking on the company’s stance against threats to public lands. The ad makes no mention of products, no enticement to shop online – only a call-to-action at the end of the video to text in defense of public lands. The company’s website is not even shown on the screen. At the end of the day, hard work and creativity will continue to win out. Marketing trends come and go, but at the root of any successful campaign lay hours of work to see it through. Work hard, understand your audience and be creative in how you execute your marketing campaigns. It also doesn’t hurt to be brave every now and then.